Click on ORDERING BOOKS above to purchase FIVE DAYS IN MAY: THE BROOKFIELD MURDERS in either E-book (Kindle, Nook, etc,), paperback or hardback formats. “Five Days in May: the Brookfield Murders” is the first in a series of Harrison Hunt Mysteries. 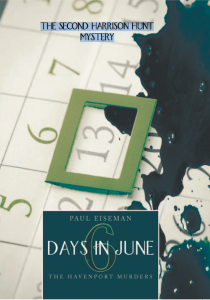 The second volume “Six Days in June: the Havenport Murders” is also available in these three formats. When noted theatrical director and playwright Harrison Hunt reluctantly leaves “the Great White Way” for the rural community of Brookfield to workshop his new productions, he has no inkling that he will soon be up to his cashmere sweater in dead bodies, scandalous secrets and enough twists and turns to stymie even the most persevering of amateur sleuths. 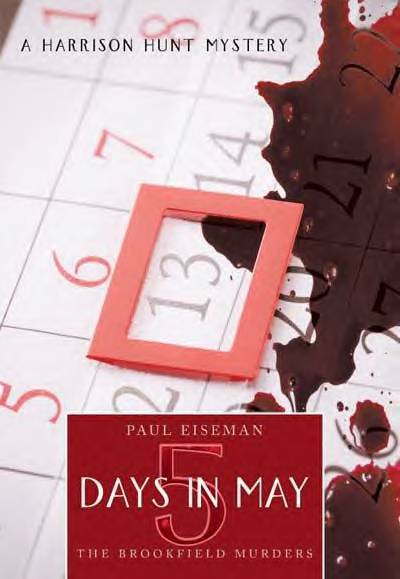 Liberally laced with cultural references (both high and low) and sprinkled with dry wit reminiscent of the Nick and Nora films, “Five Days in May: the Brookfield Murders” will delight and glue mystery and theater lovers to the last surprising and satisfying page. Paul Eiseman has enjoyed a varied and successful career in the theatre. Raised in Newton, Massachusetts, he began as an actor appearing in both plays and musicals throughout the United States. He has directed scores of productions in New York, many regional American theaters, and in London and Paris, specializing in the works of Shakespeare. He is a prominent acting coach in New York City. As a playwright, he has penned five produced plays. He is a resident of Manhattan. Mr. Eiseman has made good use of his extensive theatrical experience in creating the character of Harrison Hunt. And suddenly, somehow we were both inside Sophie’s orange beetle. Frank was in the driver’s seat, and I was beside him finding it difficult to keep the damaged passenger door shut as we lurched forward accompanied by the sound of tires screeching and gears stripping. Think of some of the greatest car chases in action films: Steve McQueen’s Ford Mustang careening through the hills of downtown San Francisco in “Bullitt” perhaps or Gene Hackman’s Pontiac LeMans obsessively pursuing an elevated subway train through Bensonhurst, Brooklyn in “The French Connection.” Well, they don’t hold a gear shift to Harrison “Hot Shoe” Hunt and Frank “Grand Prix” Gerrardi’s manic motoring through the environs of Brookfield attempting to overtake the helmeted motorcyclist who somehow managed to keep the distance ever constant between us. The high speed chase was so chaotic and stressful that I can only now remember a few harrowing details. They are recorded in my brain cells like freeze frames from Hollywood’s scariest shockers. For example, when we passed a little old lady driving a gray sedan that had practically been sideswiped by the motorcyclist moments before, her panic-stricken expression far surpassed that of Janet Leigh’s in the Bates Motel shower stall or Tippi Hedron’s while being attacked by swooping kamikaze feathered fiends. Two other heart stopping moments I shall never forget: the way we bounced as if on a trampoline while going over a speed bump at seventy miles an hour and the unforeseen and razor sharp turn we took barely on two wheels onto a narrow dirt road. My heart raced at Olympic record speeds. I wouldn’t have been surprised if the shapes of my white-knuckled fingers were permanently impressed into the dashboard I was holding onto for dear life. For dear life? Never has a cliché been so apt. Suddenly Frank jammed on the brakes so hard that my seat belt and I became better acquainted than I would like to reveal. I quickly noticed why Frank had stopped the car. The helmeted thief was driving his bike up a grassy hill much too steep for any car to navigate. It was more a path than a road, but we managed to negotiate it until we came to the top of the steep hill and the end of the dirt path. There was no way farther we could drive. We saw a flowing body of water below us to our left. “There he is.” Frank’s words made me look straight ahead. About fifty feet in front of us I saw our prey. He had evidently thought he had finally eluded us and had idled his bike to rest after his exertions. Frank shut off the car’s ignition and opened the door. Hearing the sound, the biker turned and saw us. Rays of sunlight reflected off his metal helmet allowing me to see nothing of his face making him appear even more menacing and otherworldly. Click on ORDERING BOOKS above to purchase FIVE DAYS IN MAY:THE BROOKFIELD MURDERS in either E-book, paperback or hardback formats.